Hello and welcome to Week 5 of the One Room Challenge! 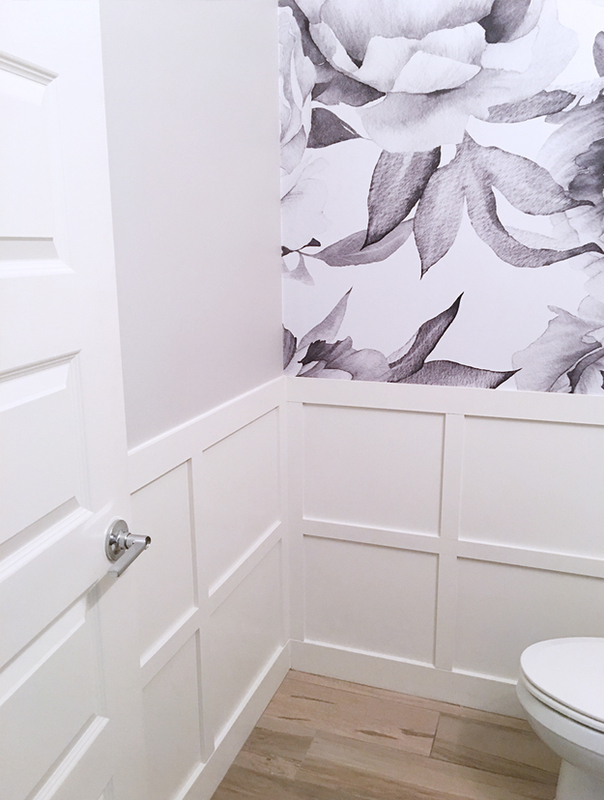 This week I painted all the MDF boards to create our finished wainscoting in our small powder room. And I just have to say… our new wainscoting looks uh-maaaazing! Can you ever have a project and not have some sort of snafu? I ran into a minor problem on two squares. After painting the inner square edges with a brush – those areas that a roller just can’t reach – then using the roller for the main interior of the square, some paint started “lifting” from the wall as I rolled over it. No matter how many coats, I knew it would looked jacked up. Has this ever happened to you? Because this was a first for me. So apparently, I was rolling back over the freshly applied paint after it already had enough time to start to “set up”. It couldn’t have been more than two minutes, but enough time to mess up two squares! So – two squares had to go through extensive sanding, spackling, sanding again and then fresh coats of paint. You would never know which two were jacked, haha! From a decorative standpoint, I just love how wainscoting gives a room more dimension! And with the square wainscoting, I’ve infused a modern element to the space. Each week as we get closer to the reveal, I start thinking more and more about some of the ‘extra’ little details and what I should place on the floating shelves. I thank God every day for the many blessings in my life, so I thought it would be fitting to add a little reminder to this space – a space that many friends and family will use. 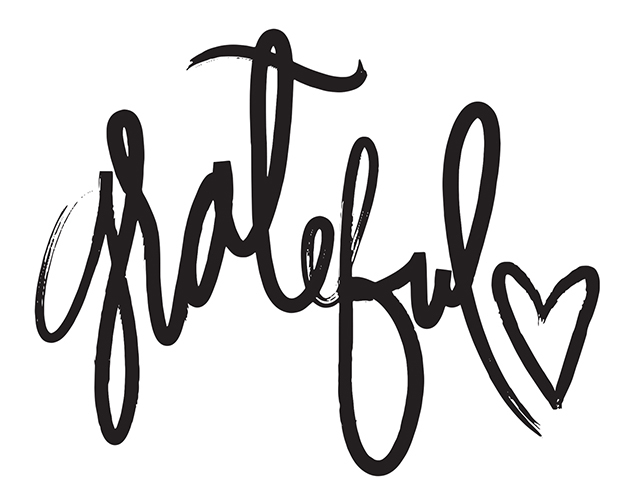 Right away, I thought of the beautiful “grateful” lettering design by Aedriel Moxley (@aedriel). Aedriel offers this design as a free download on her site here, so you can have one too! Next week I’ll be staining + mounting the floating shelves and most likely installing the new light fixture. See ya next week! What pretty wallpaper. I’m a big fan of wainscoting and have done a similar diy with it in my house. It’s looking great! Thanks Kalila! The wallpaper was the focal/inspiration for the entire space. love it all painted and great bathroom door too! so substantial and stylish! I love the accent wall – that wallpaper is gorgeous! Can’t wait to see the final reveal! I am in love with this makeover. I’m doing my office for the ORC but you’ve inspired me – I think I may do this in my powder room. Thx Andrea! I saw that at one point you were thinking of using THIS EXACT wallpaper. Great taste girl! Love watching your ORC come to life – that door! Yowza. So excited to see you are doing the ORC Tana!! Love that wallpaper and can’t wait to see this all come together for you…know it will be fabulous!!! Really love how everything is coming together. 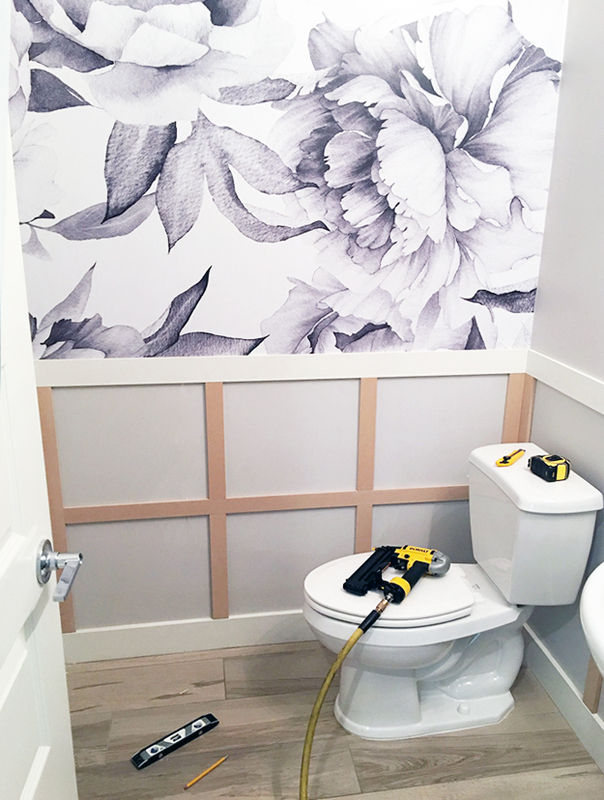 The wainscoting is a great counterpoint to the incredible wallpaper! Glad we are close to the finish line! It makes all the little snafus worth it, right?! Thanks so much for stopping by Emily! I appreciate the kind words and I’m totally with you…glad we’re close to the finish line! Tana, I absolutely love it!!!!! I might need the source for that paper and I absolutely love the crisp, white wainscoting! Beautiful job, friend!! ?